The end of the welfare state is now in process. High government debt hurts future growth. The report doesn’t discuss the cause of the problems only the impending effects. The parasite (govt.) has sucked the host (private enterprise) dry. So….ongoing volatility will be our friend as governments try to avoid the inevitable. https://www.lmcm.com/default.asp?P=868060&S=868156 His articles can be of interest though somewhat too intellectual/academic for my tastes. The average rent for a Manhattan apartment in October was $3,341, that’s 7% higher than October, 2010, reports the NY Daily News. Rents are just $53 off their all-time high of $3,394 reached pre-crisis in May 2007. The vacancy rate in October was 1.18%, below October 2010’s rate of 1.24%. On my way home I stopped to speak to several Wall Street protestors. Many seem angry and confused over bailouts for fat cats, banks, and the corporate elite while they struggle to find work, pay off debts, and redress unfairness. I don’t blame them for their fears and protests. Several told me that capitalism was corrupt. Socialism would work much better instead. Oh, how people never learn from history. First, I find it ironic that Cubans are desperate to flee in make-shift rafts across shark infested waters to leave a crumbling socialist state to reach America. Second, how can capitalism fail when we don’t have free markets in the U.S.? Our cartelized banking system reflects corporatism. If you believe that prices matter in their ability to send signals to freely exchanging participants about how to allocate resources most efficiently and you believe that centralized planning ultimately fails (as shown by countries like Soviet Russia, North Korea, Communist China, etc. ), then the Federal Reserve should be abolished. Before I provide an example of why the Federal Reserve’s debasement of the U.S. dollar is devastating to the poor and middle classes which is—I believe—the cause of the protests, I ask that you never accept what I say at face value. Seek out counter-arguments to disprove even your own most cherished beliefs. Of course, seeking out counter arguments against your investment thesis is critical to improving your thinking process and investing. Stress test your ideas. Be as astute in laying out the arguments against your idea as for your idea. The Case Against The Fed. Found here for free at: http://mises.org/books/fed.pdf (164 pages). In real life, then, the very point of counterfeiting is to constitute a process, a process of transmitting new money from one pocket to another, and not the result of a magical and equi-proportionate expansion of money in everyone’s pocket simultaneously. Whether counterfeiting is in the form of making brass or plastic coins that simulate gold, or of printing paper money to look like that of the government, counterfeiting is always a process in which the counterfeiter gets the new money first. And indeed it was. The first people who get the new money are the counterfeiters, which they then use to buy various goods and services. The second receivers of the new money are the retailers who sell those goods to the counterfeiters. And on and on the new money ripples out through the system, going from one pocket or till to another. As it does so, there is an immediate redistribution effect. For first the counterfeiters, then the retailers, etc., have new money and monetary income which they use to bid up goods and services, increasing their demand and raising the prices of the goods that they purchase. But as prices of goods begin to rise in response to the higher quantity of money, those who haven’t yet received the new money find the prices of the goods they buy have gone up, while their own selling prices or incomes have not risen. Monetary inflation, then, acts as a hidden “tax” by which the early receivers expropriate (i.e., gain at the expense of) the late receivers. And of course since the very earliest receiver of the new money is the counterfeiter, the counterfeiter’s gain is the greatest. This tax is particularly insidious because it is hidden, because few people understand the processes of money and banking, and because it is all too easy to blame the rising prices, or “price inflation” caused by the monetary inflation on greedy capitalists, speculators, wild-spending consumers, or whatever social group is the easiest to denigrate. Obviously, too, it is to the interest of the counterfeiters to distract attention from their own crucial role by denouncing any and all other groups and institutions as responsible for the price inflation. The inflation process is particularly insidious and destructive because everyone enjoys the feeling of having more money, while they generally complain about the consequences of more money, namely higher prices. But since there is an inevitable time lag between the stock of money increasing and its consequence in rising prices, and since the public has little knowledge of monetary economics, it is all too easy to fool it into placing the blame on shoulders far more visible than those of the counterfeiters. The big error of all quantity theorists, from the British classicists to Milton Freidman, is to assume that money is only a “veil,” and that increases in the quantity of money only have influence on the price level, or on the purchasing power of the money unit. On the contrary, it is one of the notable contributions of “Austrian School” economists and their predecessors, such as the early-eighteenth-century Irish-French economist Richard Cantillon, that, in addition to this quantitative, aggregative effect, an increase in the money supply also changes the distribution of income and wealth. The ripple effect also alters the structure of relative prices, and therefore of the kinds and quantities of goods that will be produced, since the counterfeiters and other early receivers will have different preferences and spending patterns from the late receivers who are “taxed” by the earlier receivers. Furthermore, these changes of income distribution, spending, relative prices, and production will be permanent and will not simply disappear, as the quantity theorists blithely assume, when the effects of the increase in the money supply will have worked themselves out. In sum, the Austrian insight holds that counterfeiting will have far more unfortunate consequences for the economy than simple inflation of the price level. There will be other, and permanent, distortions of the economy away from the free market pattern that responds to consumers and property-rights holders in the free economy. This brings us to an important aspect of counterfeiting which should not be overlooked. In addition to its more narrowly economic distortion and unfortunate consequences, counterfeiting gravely cripples the moral and property rights foundation that lies at the base of any free-market economy. Are you surprised with the government’s and banker’s lust for inflation at the expense of the poor? Imagine if the Afghanistan and Iraq (undeclared) wars had to be paid for through sur-taxes rather than the hidden taxes of debasement? Think of the lives saved as Americans rebelled against paying for ten years of military conflict. The status quo press and economists say here in this New York Times article:http://www.nytimes.com/2011/11/06/opinion/sunday/worldly-philosophers-wanted.html that “UNFETTERED” capitalism caused the global crisis. With flawed thinking (logically false premises can not make an assertion true) like that is it any wonder the Fed has the cover of legitimacy? God developed a computer to determine the IQ of the human race. The computer would be able to tailor a question based on the IQ of the respondent. The most difficult question was, “How does Stephen Hawkins’ Theory of Relativity compare to Einstein’s? reserve banking—Ponzi Finance—so not to be aware of what is occurring is financial suicide. hours studying a company as an investment, but why not spend a minute thinking about what gives value to the dollar in your pocket? What effects that dollar is one-half of every investment decision. advantage. More importantly, you need a theory to understand economic laws of cause and effect that will give you understanding of where you are in an investment cycle. Oh how I wish when leaving the University with a BA in Economics I was told to unlearn every lesson and study Austrian Economics. It’s what you think that’s so that isn’t so which KILLS YOU. seasonally adjusted, the U.S. Bureau of Labor Statistics reported today. Keynesian economists polled by Reuters had expected prices to increase 0.2 percent. 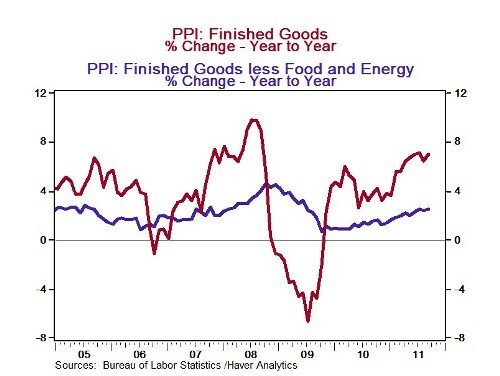 The PPI climbed 6.9 percent for the 12 months ended September 2011.
finished consumer foods advancing 0.6 percent. September, the tenth straight increase. Prices for finished consumer foods climbed 0.6 percent in September, the fourth consecutive monthly increase. Currently, Bernanke is printing money (M2) at very aggressive double-digit rates. It is this money printing that is fueling the manipulated boom. Since Keynesians don’t watch or understand the role money creation causes in the Fed created boom-bust cycle, they don’t see the manipulated boom coming until it is actually reflected in the economic data. That’s why, at present, the data are surprising them to the upside. The new Fed created money is pushing the economic data higher, but since they don’t understand Austrian Business Cycle Theory or “ABCT”, they won’t understand what is going on in the data until months of data role in showing the change in trend. A Protester Speaks the Truth about the FED. The purpose of this blog is not politics but self-directed education, especially in business, economics, and finance. A recent YouTube video struck me as a great example of how a person can understand the world and its problems by taking a vigorous effort to learn. The protester in the video below nails the problems our country is facing. He searched for the answers by reading Austrian Economics. No one told him whom to study, he did his own research and thought for himself. I would rather choose him to be an analyst or investor than a PhD. Nobel winning economist anytime. Thomas Jefferson warned us two hundred years ago that a private central bank issuing the public currency was a greater menace to the liberties of the people than a standing army.